Go Visit Hawaii was named one of the Top 13 travel blogs for 2013 by vote on Christopher Elliott’s top travel consumer site. Go Visit Hawaii’s Facebook page was named the best Facebook travel site of 2013. 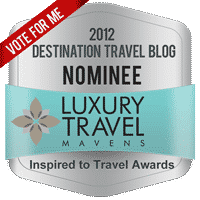 Luxury Travel Mavens nominated Go Visit Hawaii for the award of best blog for destination.Readers voted Go Visit Hawaii as the top destination blog. Go Visit Hawaii was named one of the Top 12 Travel Blogs You Should Read in 2012 by readers of Christopher Elliott’s top consumer travel blog. As an award winner, Sheila was invited to become a featured blogger for Lonely Planet. Consistently listed in the top echelon of the Top 100 Independent Travel Blogs per TravelPod’s TravelBlogSites. Here is a recent example of their list of the top 100 travel blogs. I have been reading your reviews and find so much information. We are trying to plan our visit and want to do it all, but cannot. could you give some recommendations. Oahu dec 17(afternoon arrival)to dec 22(afternoon departure)-DEC 19 Polynesian Luau booked. Maui dec30 afternoon to Jan 8 evening departure. dec 31 luau booked. So many places to go and activities to do. not closed to anything.